BitSolid is another trading platform where you can invest your Bitcoin and earn money from the interest you get. They offer an interest rate of 3.40% daily with a total effective return of 122% over 45 days. The interest rates aren’t fixed, can change any time and are based on thefund’s performance. Just like other investment platforms they give an interest rate of 1% during the weekend. The returns of BitSolid are higher than BitConnect, but the platform is more risky. In this review, we investigate what BitSolid is, whether it’s a legit company and we share our own experience. Share your own experience in the comment section. Invest your Bitcoin into BitSolid's program and get a 3.4% interest rate daily. Create an account now and calculate what you can earn. BitSolid is a very clean looking investment platform where you can invest your cryptocurrency. You get a variable daily interest over your investment and can withdraw your earnings every day. BitSolid uses artificial intelligence to trade on the cryptocurrency market and to generate profits. They have more than 3 years experience with live trading and it’s now accessible to individuals. The software and trading bots have been tested for more than four years before launching it. The bot that’s based on artificial intelligence uses a trading strategy that combines more than 15 algorithms and uses the API of the biggest cryptocurrency exchanges like Poloniex, Bittrex and GDAX. The trading bot makes trades between exchanges and earns money off the differences in price. The artificial intelligence is not only used to check the market prices, but also scans press releases, news reports, financial reports and social networks for signals that could indicate that a cryptocurrency will go up or go down. The system searches for patterns, learns from it’s actions and can connect dots that humans can’t see. All trades that the bot does are almost risk-free and the bot hardly loses money. The strong positions in the capital and automated risk controls protects investors from large losses. The bot only trades healthy cryptocurrency with a market capitalization over 1 billion USD. Investing Bitcoin into the BitSolid program? Investing into the program is very easy and user-friendly. You can start with a small amount of 0.003 BTC that’s currently equal to approximately 19 USD. There’s a built-in calculator in the dashboard where you can calculate your profits. Your deposit will be held for 45 days and the total return will be 122%. You can see in the calculator your daily profit, the total profit and the total projected return. We invested 19 USD into the program just to try it out and to test it. You can only transfer Bitcoin to the program, they will support more cryptocurrency in the future. You can decide for yourself how much money you invest as long as you reach the mimum deposit. Currently there’s only one plan where you can withdraw your daily interest. Depositing Bitcoin into your account is nothing more than simply send your Bitcoin to the Bitsolid wallet address. You can reinvest your profits into the program or withdraw it. You can withdraw your earnings daily in the withdraw section and the minimum withdraw amount is 0.003 BTC. After 45 days your total investment plus 22% will be released to withdraw. For example: You invest 0.003 BTC and get a daily return of 3.4%. Your break-even point will be in about 37 days, everything after that date is pure profit. You will get 0.000102 BTC daily and a total profit of 22%. Is BitSolid a scam or legit? The opinions about this program are very divided. The community has become very scared because of the recent scams. Currently, this program pays well and many people have generated profits here. Make sure you invest wisely in these types of programs and never more than you can miss. Don’t invest your rent, your full salary or grocery money in BitSolid. You can start investing with a low budget, and your capital will be released in a short period of time (not more than seven weeks). Comparing this with to the BitConnect program the BitSolid program will give you your money back sooner. The website is hosted by NameCheap, Inc, and they use a SSL certificate. 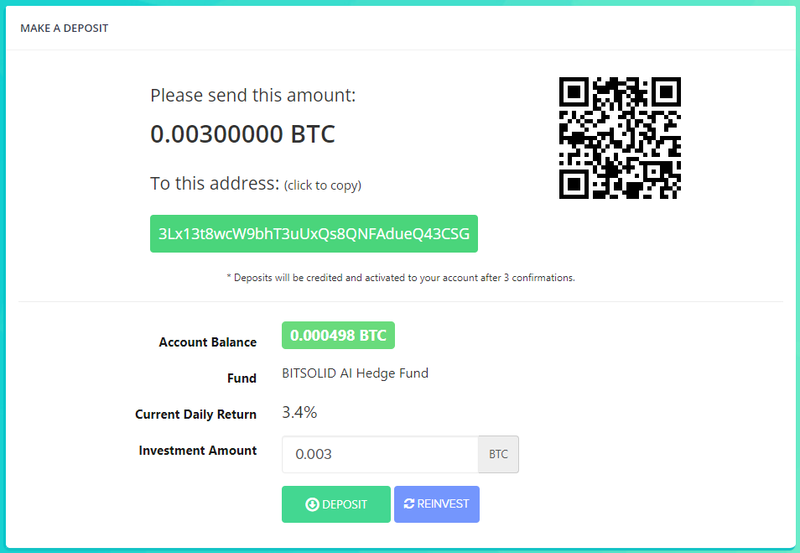 BitSolid is an investment platform where you can invest your bitcoin and receive interest on a daily basis. BitSolid uses Artificial Intelligence for their trading bot to generate profits on the cryptocurrency market. They trade on popular exchanges like GDAX, Poloniex and Bittrex. They can offer interest at 3.4% daily, have a Solid Risk Management and payment proofs.